Kududu Guest House - Sunland Accommodation. Far from the madding crowd, on a hill overlooking the luscious Sunday's River Valley and on the doorstep of the world renowned Greater Addo Elephant Park, lies Kududu Guesthouse, a haven of tranquility and comfort, waiting to be discovered. 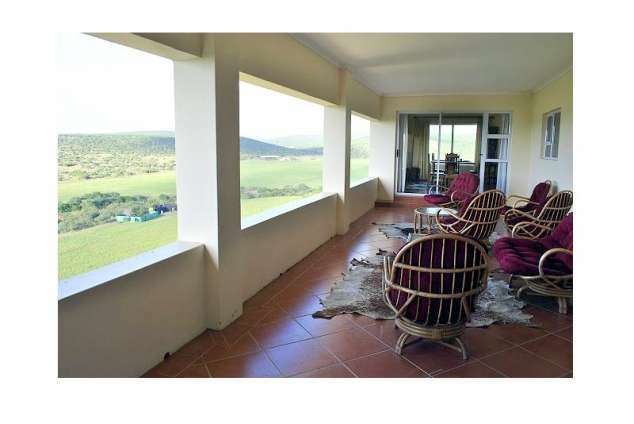 Nestling in and surrounded by the well known valley bushveld, Kududu has panaromic views across farmlands and extensive Eastern Cape bush which is a malaria free area. It's position allows for complete relaxation in a tranquil and luxurious setting. We are ideally located in the central area of the Valley, making many day tours or excursions easily accessible. Our en-suite guest rooms are situated around a tranquil indoor garden and each room has it's own private entrance. All the rooms and cottages are equipped with tea/coffee making facilities, hairdryers, DSTV/M-Net and air - conditioners (warm and cold). Crisp percale linen is used on all our beds and personal toiletries and towels are provided. The two garden chalets positioned in secluded areas in the garden, each sleeping up to 4 persons, with a lounge and private veranda. The garden chalets, equipped with air conditioning, have a B&B / self-catering option. They are elegantly furnished with a spacious living area and kitchenette. There is also a private veranda with a beautiful view of the farm and indigenous bush. There is one en-suite bathroom downstairs an upstairs a landing with two single beds. A first in the Sundays River Valley is an exceptionally luxurious guest room catering for anyone who would like to experience the stunning beauty of Africa's starry nights, especially the Milky Way and the Southern Cross. It is situated about 100 meters from the lodge on the edge of a bushveld ravine where bushbuck, kudu,nyala and zebra wander freely around the terrain and waterhole. For the more adventurous nature lovers who would like to enjoy the essence of Africa we have added a traditional African hut, exactly like the ones still inhabited by millions of African families today, about 3 km from the main guest house in the nature reserve. Transport to and from Mikhaya will be provided if needed. There is no electricity or hot water, but candles and paraffin lamps are available and lots of wood for making fire to cook or heat water. Our pool and lapa area are for the exclusive use of our guests and pool towels are provided. Dinner is served on request, however Anri will also be pleased to book tours, excursions or dinner at one of the many restaurants in the surrounding area. Guests can also enjoy the jacuzzi with a stunning view. 9106 page views since 24 Apr, 2008. Last updated on 24 May, 2018.